Specimen Mounts: Riker Boxes -- Heavy telescoping box construction with glass top. Covered with black embossed paper. Filled with white polyester batting. Approximately 3/4" deep. For mounting butterflies, insects, shells, botanical specimens. 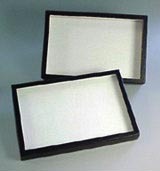 Exhibit Cases -- Sturdy glass-topped boxes, covered with black embossed paper and lined white. Cases measure approx. 2¼" deep outside. Our most popular version has 3/8" pinning board covered with white etha foam and measures about 1½" inside. Art card, plain, compartmented, and padded also available. 8" x 12" . . . . 12" x 16" . . . . 14" x 21"
Display Mounts -- These mounts are similar in design to the specimen mounts, but have either a 3/8" thick pinning board bottom or are filled with white padding. They are approximately 7/8"deep inside with the pinning board, 1¼" without. The pinning board is covered with white etha foam. Used for the display of small skeletons, botanical specimens, and insects. Standard Insect Boxes -- A quality storage box of heavy cardboard, covered with black embossed paper and lined white. Cover has nickel plated hinges for durability and overlaps neck for protection of specimens. Includes 3/8" pinning board covered with white etha foam. Outside dimensions 10" x 12" x 2½". Inside depth 17/8". Used to contain fumigant for protection of specimens. Use in display mounts, exhibit cases, or insect boxes.